Wow had an awesome night and got to bed at 3.30 am a little worse for wear! So today I have to use my face as the canvas and paint on a pretty face not in my normal naive art style though! Last night was the Model Reunion for one of the modeling agents in town and even though I was a” ring in” (I modeled for the opposition at the time) I still had a great night. One thing that we all commented on was that’ back in the day’ it was not a bitchy profession and most girls actually had each other’s backs covered and all got on really well. Which is why I felt quite comfortable being in the ’oppositions camp’ as it were! 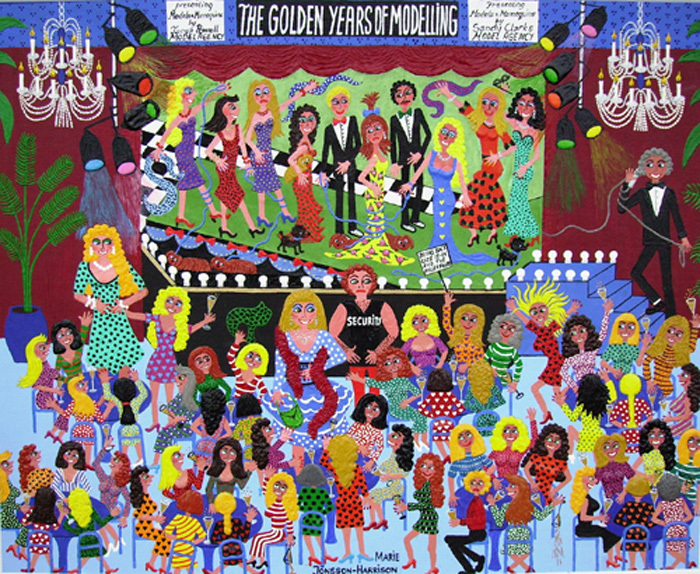 This painting the’ Golden Years of Modeling’, was auctioned off on the night and I was delighted to see vigorous bidding for it, even nicer was the fact that it was bought by Sue; someone I used to model with and have not seen for maybe 20 years or so. Art & The Golden Years of Modelling! Sue was working at the time for a manufacturing agent called Saville Row where they designed men’s shirts and also handled a few other ranges of women’s clothes and they hired me to be the in house model/receptionist a job I shared with her. At the time it was my first modeling job at 17 years old and I was in awe of Sue who was a couple of years older than me and very sophisticated and gorgeous. So I was really thrilled to see that my artwork will be hanging on her wall and I hope it will bring back great memories and amuse her whenever she looks at the painting. The night was full of models, photographers, agents, journalists and advertising people some still in the business and others long ago retired. I did expect to see a lot of ‘trout pouts’ but am happy to report that most of the beautiful people were still beautiful in a natural way, there may have been a tuck here or there but nothing obvious. We had all gotten older though and some had put on a few pounds but everyone that turned up, were still gorgeous and several could still give the new girls a run for their money if they hit the catwalk. We giggled and laughed and reminisced, drank champagne and wines, ate canapés. The night was handled superbly by Jane Reilly from Channel 10, and there was even a 35 minute DVD of photographs and old commercials which brought back memories. Jane and I initially met many moons ago in the Beach Girl Quest long before I was an artist. There was loud cheering and whistling by some of the models children when they saw their mothers strut her stuff in a segment of the Rocky Horror Show, they were so proud, whilst their father tried to quiet them down. All in all a very fun night! We had good intentions to catch the last train home at 12pm but guess we missed that by a long shot, so taxi it was. As it turned out it was a very nice ride home, our taxi driver was a turban wearing Indian sheikh a lovely chap and we chatted all the way home. He was going home to get married in December to a girl arranged for him by his parents which is their custom. “The oldest, shortest words-“yes” and “no”- are those which require the most thought.